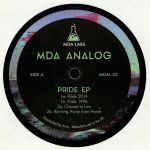 Review: Straddling the line between deep house and techno, MDA Lab's second release reissues the 1996 Nova Zembla classic "Pride", along with three new bangers: MDA Analog offers up "Pride 2019" - a slower and funkier version fit for the times. "Choose to Live" presents the listener an escape into positivity-laced reverie hinting at the deeper days of halcyon. Lastly "Running Away from Home" navigates more firmly back into techno realms.